Corn…. here, there and over yonder! Oh, the delicious time of summer is here in all its golden glory, and I don’t know about you, but I just can’t get.enough.CORN! 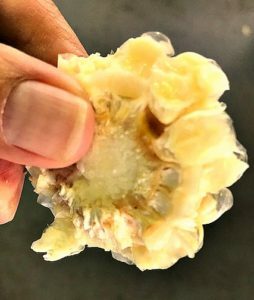 I love it raw… lightly steamed on the cob… grilled… in my grandma’s corn puddin… as a side…. or as a meal, like last night when I made my favorite corn salad. Just good nekkid food at its finest…. nekkid just like the Good Lord gave it to us! 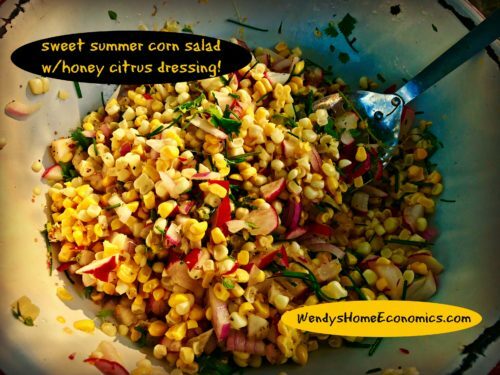 Enjoy this vibrant sweet summer corn salad with honey-citrus dressing! Corn time is HOT time here in North Carolina, so anytime I can “cook” supper, without cook’n a damn thing…. well, that’s what I’m talkin’ about. I tell you, we just do not appreciate our local farmers enough… who toil in this heat for US… and bring us their goodness, for such bargain prices! I get a tad defensive when I hear folks saying “that food is more expensive… I can’t afford it.” Say WHAT? I sometimes feel like I’m stealing from them, and just say “keep the change” even though it’s a mere pittance of what they deserve. Having come from generations of farming families in rural NC, I consider them to be “my people.” I know my food didn’t come from the back cooler at the Food Lion. So when I have the choice, it’s farmers’ market freshness for this gal. …tasty little wheels of fresh summer corn at Raleigh State Farmers Market! 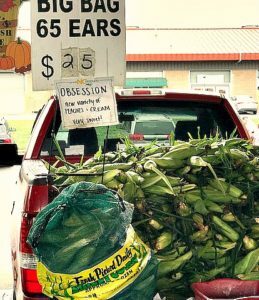 …one of many fresh corn vendors at the NC Raleigh State Farmers Market! try to buy from different farmers each trip to share the love. I think about how early they had to rise to get that freshly harvested load of corn to the market… some coming from counties away. Sleepy. Hot. Tired. …and ready to call it a day! And probably not interested in cook’n anything either when they get home. So wherever you are, run to your local farmers’ market and shop! And don’t cook this salad for supper. Grab some fresh corn…. field peas that are abundant right now, squashes and tomatoes and peaches and figs and melons…. oh my! The bounty right now is endless… too bad it can’t be available all year long, although if it were, it probably wouldn’t taste nearly as good. Savor the seasons.… and Make.Corn.Salad! Your mouth (and those you share it with) will thank you!! What could be wrong about combining these delicious ingredients together? 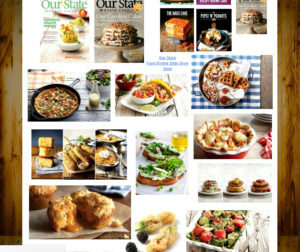 The dressing is so simple…. bright and flavorful, and citrus is the perfect pairing with the corn. Summer = Farm Fresh Vegetables! And there are few things better that freshly pulled corn. 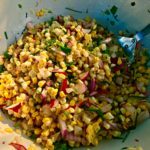 The hardest thing about corn is deciding which way to eat it on any given day, but when my craving sets in, I just MUST stir up this summer corn salad. 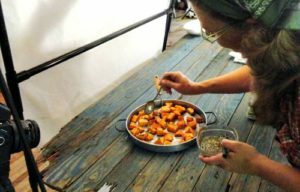 There's just nothing like the sweet corn, with its little "bite" stirred together with some feisty radish.... and freshly snipped herbs all dressed simply with honey and the bright flavors of citrus! So run to your local farmers market and get some sweet corn and make some for yourself. But watch out, it's addicting! Combine all vegetables and herbs in large mixing bowl. Drizzle with honey and juices. Add spice rub and stir to combine. EAT!! Feel free to add other herbs that you prefer. I just use what I have growing in my herb pots around the porch. Feel free to throw in other veggies too! I sometimes add a little bit of minced celery to this salad. Just don't get too carried away and lose focus on the CORN. 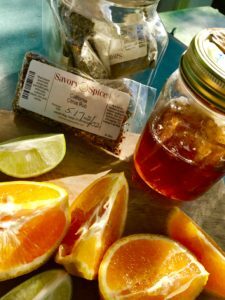 If you do not have a Savory Spice Shop near you (although you can order their incredible goodies online!)... just look at what they have in it and use similar things. I do love pairing citrus with the honey for this salad. It just seems like a perfect match. You can zest your orange and lime into the salad and add whatever seasonings you have on hand. Don't not make it just because you don't have the SSS rub. Tomatoes… my love! I doth live for this tasty time of year when they are bountiful at farmers’ markets and in generous friends’ gardens. 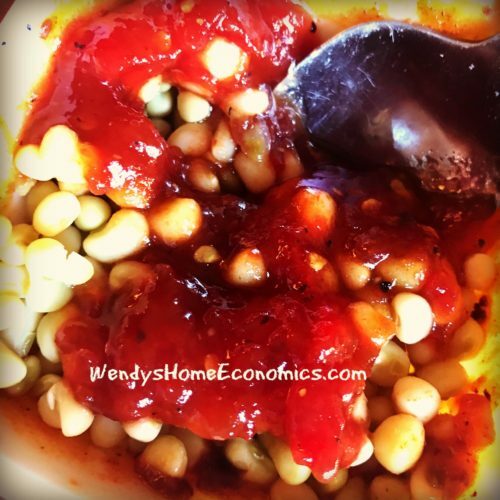 I make tomato sauce…. 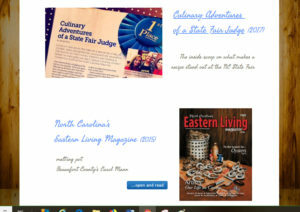 plain I can spiff up at time of use, and spicy Arrabbiata too, to heat up with some local North Carolina coastal shrimp that cook in the sauce as it heats to spoon over garlic bread, pasta or spaghetti squash for a quick supper. 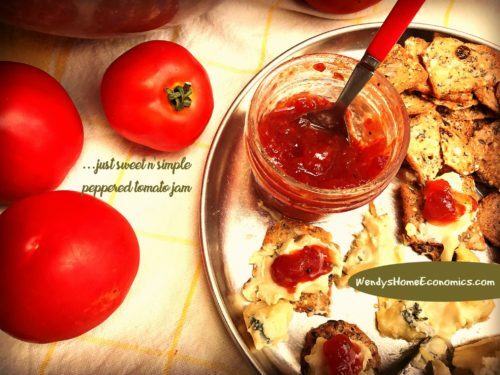 Today, I’m enjoying my latest batch of tomato jam. I have tasted many a tomato jams, but my personal preference is this simple concoction… without heavy spices found in some. I make in small batches to eat on and share, so I don’t always do the canning process, but you certainly “can.” I will probably do that later in the summer to store away some to get me through until next year this time. But now, while starting to be plentiful, and some farmers will sell “canning tomatoes” at a huge discount, I’ll just keep making my small batches. 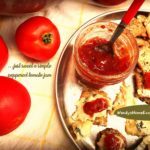 Tomato time is happy time, and this truly simple tomato jam will put a smile on everybody's face! Heat pot of water to boiling. Cut "X" shape in bottom of each tomato. Put tomatoes into boiling water for about 1 minute or until you see skins start to loosen. Cool to touch. Peel, core and cut into half-inch size pieces in colander to drain juice (save for another use or sip). Pour sliced tomatoes into heavy pot or Dutch oven. Add remaining ingredients and bring to a boil. Reduce heat to medium and continue cooking until your jam reduces and it thickens and gets "jammy." Ladle into jars, cover and refrigerate. If canning for future use, follow instructions on canning jars for processing. 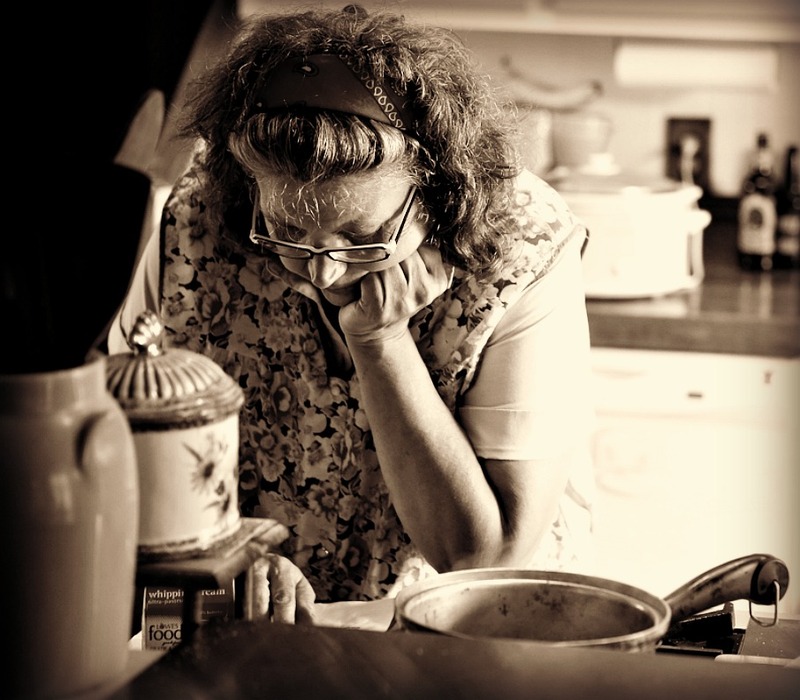 Without processing, the jam will be fine in refrigerator up to about 6 months, if it lasts that long! The 2 hours of cooking is approximate. If needed, cook less or more... depending on how yours thickens up. Some folks like to add in about 2 teaspoons of lemon juice, but I personally don't care for that, but is an option if you want to add.